You can here his whole interview here. Saban is as tall as Deez Knees. Oh, look! 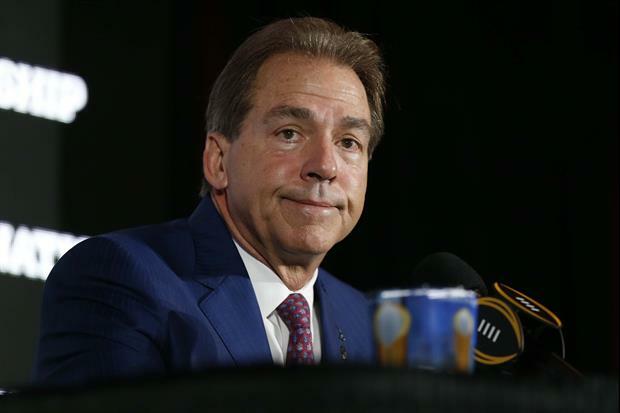 It’s a Gump insulting everyone’s intelligence by lying to us about Saban being a “player’s coach” This is just a made up story and PR stunt to bolster the midget’s image. He isn’t a “player’s coach” and never will be. What years did you play for him? "he just gets mad, gets to cussing out Eddy. And that’s one of the longest referees we’ve ever had there." 100% chance this guys is hired by the SEC by the end of today. He's told Ed O to "hold deez" a bunch. Ed O falls for it every time, too. Sounds like he only went for the low hanging fruit. Don't try to convince us that saben is funny. He is a miserable SOB just like Bill Belichick. I admit that I really wish they were coaching my team. But, they are not funny.